Richard joins Hodgkinsons after working with a previous firm in his home town of Norwich where he completed his training contract and worked predominantly within their Conveyancing Department for over three years, gaining vast experience in this area of law. 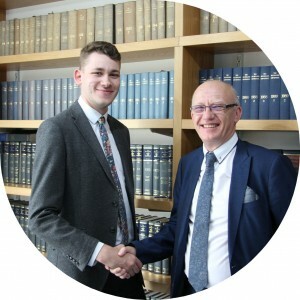 Richard obtained his law degree from the University of Lincoln and completed his legal training (Legal Practice Course) at Nottingham Law School. Richard is no stranger to Hodgkinsons having previously undertaken work experience at the firm during his time at Lincoln University. Richard said: "I am delighted to be given the opportunity to join Hodgkinsons and come full circle with a firm I originally started work experience with. Hodgkinsons has an impressive property department which is headed by Robert Foster, Director, and I am looking forward to continuing my career with them." At Hodgkinsons we understand how daunting it can be to either purchase or sell a property especially if you are first time buyer. We would therefore recommend you get in touch with Richard who can guide you through this process and relieve you from the stresses usually associated with these types of transactions. Robert Foster said: "We are thrilled to have Richard on board and become a part of our team. We are sure he will prove to be a great asset to the firm and has already proven popular amongst our existing client base." If you are looking to buy, sell or re-mortgage your home, get in touch with Richard on 01754 897 150 or email him at RStrange@hodgkinsons.co.uk. Alternatively, you can submit your enquiry online to find out how he can help you.